It’s everyone’s favorite campfire treat, in cupcake form! Moist, honey-graham cake filled with marshmallow and topped with an easy chocolate frosting. Well, here we are. It’s the unofficial end of summer. Sad face. I know that technically we have a few more weeks to go, but in my mind, summer ends when school starts. And my oldest has his sixth grade orientation at middle school today (where has the time gone???). We’ve spent many a warm summer night out back in front of the fire pit, making s’mores. Toasty, melty marshmallow, crunchy grahams, and chocolate- what a great combination! It’s inspired so many delicious treats, like this S’mores Pie, these S’mores Cupcake Jars, and this S’mores Frappucino Granita. Luckily, I’m managing to also get these s’mores cupcakes posted before summer’s end. Because when I think of summer, s’mores are always top of mind. 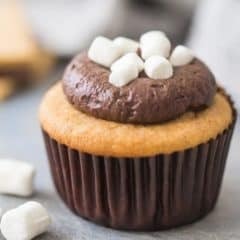 I’ve seen s’mores cupcakes made in all sorts of ways, but the important thing is that all the components are represented. Those being: graham, chocolate, and marshmallow. For this version, the cupcake itself is a moist honey graham cake recipe. It’s just like a graham cracker, only soft and fluffy. And we are filling it with marshmallow cream! Aka: “marshmallow creme” or “marshmallow fluff.” You can use store bought if you like, but I am especially partial to this recipe: Homemade Marshmallow Sauce. The cupcakes get topped with my favorite Easy Chocolate Frosting. It whips up in a snap and has so much rich, chocolate flavor. The final touch is the micro marshmallows. I found mine at a local ice cream shop, but they can also be ordered online: Micro Marshmallows. It all starts with the cake. Get the cake flour, graham flour, brown sugar, baking powder, baking soda, salt, and cinnamon in your mixing bowl, and give it all a quick stir. For more info on cake flour, click here: Why Use Cake Flour. I get my graham flour at the regular grocery store, right next to all the regular flours. If you have trouble finding it, check out the aisle where gluten-free items are sold (it’s not gluten-free, but sometimes they stock it in the same area). Or, you can buy it online: Graham Flour. Mix in the butter next. After about a minute, the mixture should resemble damp sand. Then add the eggs, blending until smooth. Finally, the sour cream, milk, honey, and vanilla go in. Beat the batter for a minute or so, to aerate it and develop the cake’s structure, then portion it out into your cupcake pans and bake. Once the cupcakes are baked and completely cooled, use the tip of a sharp knife to cut a little well into the center of each one. Then spoon in the marshmallow, and cap it off with chocolate frosting. I used a jumbo round tip to pipe on the frosting you see in these pics and in the video below. The cupcakes can definitely be baked ahead. You can bake them up to 2 days ahead and keep them at room temperature, *or* a week ahead refrigerated, *or* a couple months ahead and frozen. The filling and frosting can also be made ahead and refrigerated for about a month. It’s preferable to fill and frost the cupcakes just before serving. Over time, the filling will start to soak into the cake and kinda disappear. And a cupcake with just a hole inside is a sad thing. If you need to do it a few hours before, I would recommend refrigerating the filled cupcakes, to slow down that filling from soaking into the cake. Make these yummy s’mores cupcakes for your end of summer bash! They’re perfect for a party and your guests will absolutely adore them. 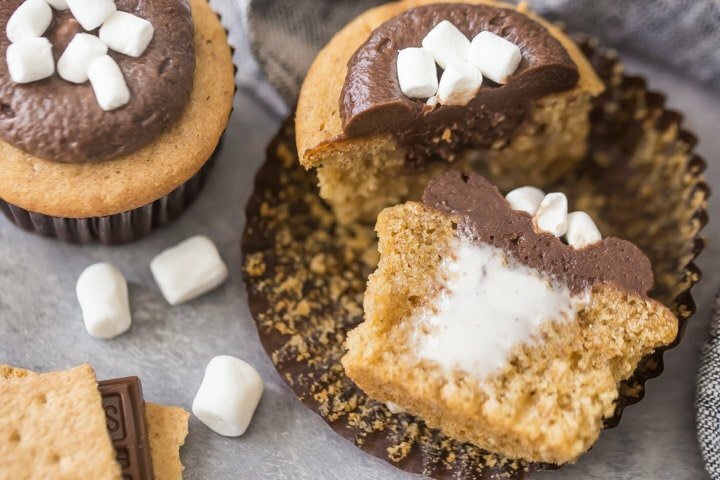 It's everyone's favorite campfire treat, in cupcake form! Moist, honey-graham cake filled with marshmallow and topped with an easy chocolate frosting. Place the cake flour, graham flour, brown sugar, baking powder, baking soda, salt, and cinnamon in the bowl of an electric mixer and stir together to combine. Add the butter, and mix on medium-low speed until the mixture resembles damp sand (about 1 minute). Mix in the eggs on medium-low speed, until smooth (about 1 minute). Add the sour cream, milk, honey, and vanilla, and mix on medium-high speed for about 2 to 3 minutes, to aerate the batter and build the cake's structure. Transfer the batter to the prepared pans and bake for 16 to 20 minutes, or until a toothpick inserted in the thickest part of a cupcake comes out clean or with a few moist crumbs. Cool completely, then fill with marshmallow and top with chocolate frosting. Place the butter, salt, and cocoa powder in a large mixing bowl, and add about 1/3 of the powdered sugar. With an electric mixer, beat on medium speed until combined. Add the remaining powdered sugar (in 2 more additions), beating until combined. Stir in the cream*** and vanilla, then turn the mixer up to medium-high speed and whip the frosting until light and fluffy. *Learn more about cake flour here: Why Use Cake Flour. 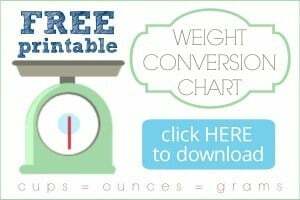 **Greek yogurt or buttermilk can be substituted. Make your own buttermilk by stirring 2 teaspoons of lemon juice or white vinegar into 2/3 cup of regular milk. Allow the mixture to stand for 5 minutes, or until thickened and slightly curdled. ***The amount of cream needed can vary. Start with 3 tablespoons and add more if necessary. You just want it to have a nice spreadable consistency, without being too loose or runny. I just can’t get enough s’mores! These cupcakes look amazing! ahhh so cute!!!! 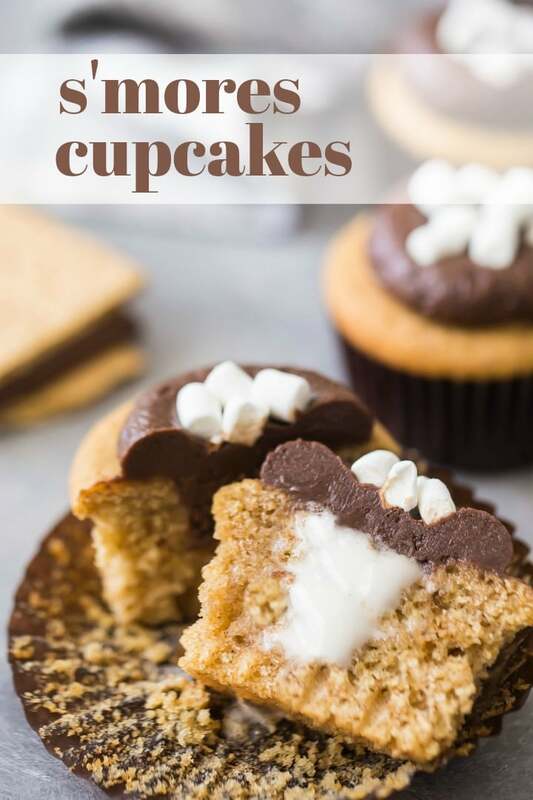 I’ve never seen s’mores cupcakes exactly like these, they look great! As long as you have a big enough mixing bowl it shouldn’t be a problem! 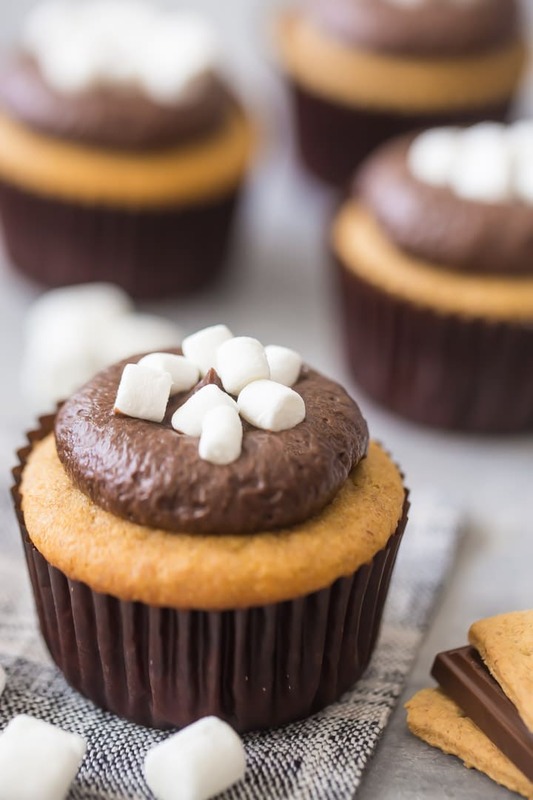 These s’mores cupcakes are such a fun dessert! Who wouldn’t love these all year long?! The only thing that makes a cupcake better in my opinion, is when it has a filling- so these are perfect! This is the first time that I have made smores cupcake. The recipe tasted great and importantly it was easy to follow. So glad to hear it Chuck! Thank you so much for the great feedback!